Blankets ship out the next weekday. Transit time is normally from 1-5 weekdays. We love the blankets! They're a big hit with the kids and us! 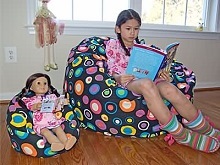 The bean bags have held up really nicely - they're used and abused!